A solid morning of running for Jarno Trulli was interrupted by a mechanical problem that ended his running, and unfortunately a replacement part was not on hand to get back on track. 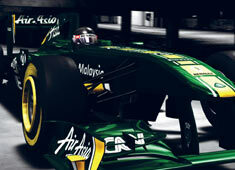 The Lotus team is now hoping for a more reliable package in time for Heikki Kovalainens running on Saturday and Sunday. Jarno Trulli: "The morning went well for us. We managed to do a decent number of laps and put in a couple of quite long runs but then we had to stop with a mechanical issue which could not be fixed in time for me to go out again today. I would have liked to have had more running today but this is all part of testing a brand new car - we need to iron out the problems now so when the races start we have ironed out all the problems. Hopefully Heikki can put in some decent mileage over the next couple of days and really start to push the development of the car." Dieter Gass, sporting director: "We had a promising start to the day. We found some interesting results from the setup work we did and have continued to learn more about the Pirelli tyres and how to maximise their grip levels on the car. Overnight we were able to fix the issues we had yesterday but unfortunately we had a mechnical problem at the front of the car that we were not able to fix in time today, but the spare parts we need are arriving from the factory tonight so we will be in good shape for Heikki to get into the car tomorrow."